Archive page for Rainhill Civic Society's web site. Quite a bit of material has appeared on our Latest News page since the site was started and, clearly, we can't keep it all there for ever. Even though it's out of date, members and others may like to see what happened in the past. This page is an attempt to collect together those items. They are not organised but merely transferred from the appropriate pages. Apologies if the page formatting doesn't always work. The archive was started in June 2002 so the earliest material has not been included, unfortunately. So far it's not searchable but but you can use "Find" under Edit in the internet Explorer toolbar, if you know what you're looking for. Please let us have your comments. This catalogue was one of the highlights of Pauline Hurst's recent talk to the Society. She spoke about the Bretherton Family's time at Rainhill Hall, which later became Loyola Hall (see below).The catalogue related to the final sale of the Hall's contents in 1923 when the premises were sold. This is St Anne's Well, a medieval well on the borders of Rainhill. Society members were able to visit the site, which is on private land, by invitation of the farmer and Historic England, who have recently excavated and preserved the well. Representatives of Historic England explained the history of the well and the work they had undertaken to restore it. At our meeting on March 28th, 2017, Tamsin Cooke of Historic England will talk about the organisation and give us more information about the Well. Members of Rainhill Civic Society's committee met a representative of the agents handling the sale of Loyola Hall at the Hall recently. A number of points emerged. • Nothing has been decided yet. • A number of prospective buyers have shown interest in the site. Their ideas cover a range of options for the use of the buildings and land. • Offers to buy will be considered in the next few weeks. • The detailed plans shown in a document widely circulated recently by the agent are only one option and have not been put forward as a proposal. • The trees on the site are subject to an overall Tree Preservation Order. • Any proposal by a buyer will be subject to a formal planning application to St Helens Council. A major issue, recognised by all, is whether the site should be removed from the protection of the Green Belt. • The main building is Grade 2 listed and any changes to it would need approval from Historic England. Coffee - and much more. The Heritage Coffee Morning on 15th October went well. Plenty people dropped in for a chat and had a look at the displays and the slideshow. Mrs Sham Murthy was the overall winner of this year's Rainhill in Bloom. Here she is receiving the Rosebowl Trophy from Cllr. Trisha Long, Deputy Chair of Rainhill Parish Council. We are grateful to the Co-op here in Rainhill for accepting our application for funds from their newly launched Community Fund. We have earmarked the money for plantings in Rainhill to brighten up the Village for the whole community. Co-op members can nominate us and 1% of their spend on Co-op own brand goods will be sent to us at the end of the initial six-month period. Keep a lookout for details when you are shopping in Rainhill. The results are out. Follow the link from the panel on the front page. A post on the Facebook page "History of Rainhill Only" regarding a proposal to build 550 houses on land off Mill Lane, towards the M62 has caused much concern. We have contacted St Helens Council about this and we have posted the following reply on that FB page:- James Tasker's post about the land south of Mill Lane has understandably raised great concern. We have received the following information from St Helens Council. As part of the Council's "Call for Sites" consultation concerning Green Belt release for the next "Local Plan" potential developers, or anyone else, could put forward suggestions for land to be taken from the green belt for housing use. This is what Wallace have done on behalf of the owner. No formal planning application has been made and no decision as to the suitability of the land for housing has yet been considered by the Council. The whole Local Plan has still to be established, after which there will be a period of consultation later this year. Rainhill Civic Society is registered as a consultee and we shall be making our opinions clear. We have already expressed the view in an earlier consultation, that "brownfield sites" should be used up first. 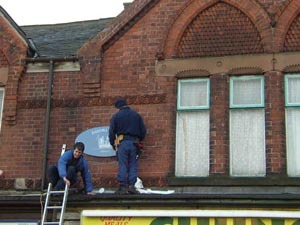 Society members have always been active in trying to keep Rainhill looking good. These pictures show two projects 36 years apart. You can see some of us tree-planting in 1980 with a picture of the tree as it is now. Also, this year's Easter weather didn't deter a few hardy souls from sprucing up the trough in the precinct. You can see it was worth it. On Sunday, 3rd July, Rainhill Parish Council organised a well-attended ceremony at the War Memorial in Warrington Road. As well as commemorating the 100th anniversary of the Battle of the Somme the event saw the addition of further names to the memorial, men who died in the Great War but whose names had never been recorded there. Brian Renshall of the RCS was instrumental in putting forward these names and he took part in the ceremony. Also participating was Ann-Veronica Howitt, who gave details of the events in WW1 which led to the twinning of Rainhill and Latour en Woevre in France. This is a selection of the shop window displays in Rainhill to celebrate the Queen's 90th birthday. The Society invited the shops to take part. Click on the image to see the pictures. These are some of our committee members "manning" the stall at this year's Rainhill Gala. Our newish web site rainhillremembers.uk, which largely deals with Rainhill's part in WW1, has scored an international hit. Someone from Belgrade in Serbia contacted the site with an enquiry about her grandfather, who she believed died in Rainhill Hospital in 1946. With a bit of research Society members were able to track down his grave in St Helens. We received a heartfelt message of thanks from Belgrade. We had a good AGM on 17th May. While the current officers and committee were re-elected for a further year, we also had interest from some new members, who are keen to make a contribution to the Society's work. The review of the year past showed how the group has been active on many fronts. Not least is our vigilance over planning applications, some of which threaten the character of the area. This will be one to watch in the coming year. Society members did a bit of pruning and tidying in the Village centre at Easter. It was woolly hat weather, as you can see. We have just received this picture from our twin community in France. So if you're ever driving along the D23, keep an eye open for the sign. For some years the Society has been concerned about the deteriorating surroundings of the ancient cross in Mill Lane. When houses were being built in what is now Stone Cross Park, some landscaping was done around the re-sited cross. Now some of our members have been working with the Borough and Parish councils to get things tidied up. These picture show the cross with its new plantings and as it appeared until recently. You can also see the cross in its original setting. We are grateful for the help provided by our local councillors. The cross as it used to be. St Anne's Well is an ancient monument on the edge of Rainhill. Work is currently being carried out there to assess the best way to preserve it. This is good news. We have received further confirmation from Historic England that the work is fully authorised and is being carried out by them. This matter is a good example of a Society member keeping a watchful eye on what is happening around us and alerting the Society. We then followed it up to ensure that the work was being done responsibly. Please note that the well is on private, cultivated farmland and cannot be visited by the public. We had a very entertaining meeting on Tuesday, February 23rd, when Richard Baker convincingly inhabited the persona of Henry Yates Thompson, Liverpool millionaire and Victorian adventurer. Thompson was incredibly proud of "his" Palm House, which brought to Sefton Park examples of the world's plants for people to experience for the first time. The park, like others he helped to pioneer in the city, was a place where residents of all social classes could enjoy an outdoor life as industry encroached on open spaces. Thompson's legacy to the City still benefits today's citizens. The picture shows Richard as Henry Thompson with Christine Scott, our President, whom he persuaded to be his paramour. At the first speaker meeting of 2016 on Tuesday , 26th January, we heard about Beechams. According to our speaker, Pauline Hurst, the Beechams were a canny lot when they set up their fledgling pharmaceutical business in Victorian times. They knew working people couldn't afford doctors' bills and they aimed their cure-all pills at that market. They went from strength to strength, using all kinds of advertising. The Beecham boys liked women and had a plentiful supply of wives and mistresses. Eventually, the firm, long a mainstay of St Helens employment, was absorbed by other companies and its iconic building is now part of St Helens College. Moira Dickinson, a committee member, and Edith Vouge of Latour en Woevre are seen here when they met recently in France. Edith has been our point of contact ever since Ann-Veronica Howitt first discovered the links to Rainhill that eventually led to the twinning. Moira is on the left. 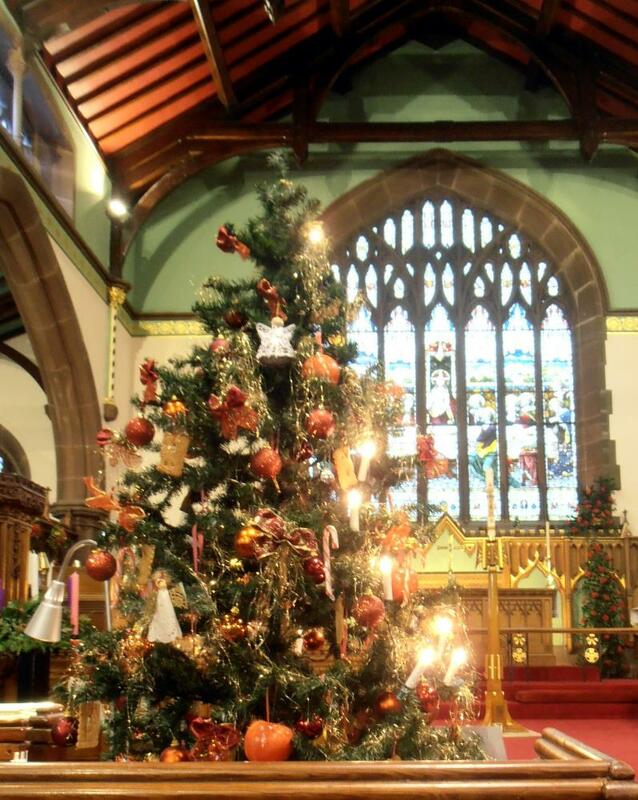 This is the Society's tree in the Christmas Tree Festival at St Ann's church. The tree itself is French and dates from the period 1910-1920. An explanation of the symbolism of Christmas tree decorations was presented to visitors by helpers from the Civic Society. A moving and unexpected addition to our exhibition was on show on Saturday, November 14th.. Ann Veronica Howitt, who has been the Society's link to Latour en Woevre in France, now twinned with Rainhill, has received three fir trees made from WW1 barbed wire and shrapnel. 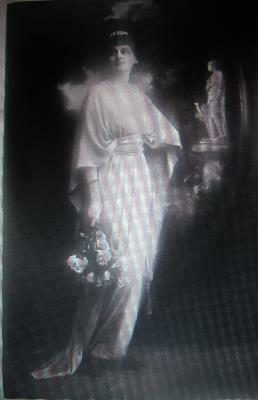 The gift was sent by Edith Roma-Vouge of Latour. If you look at the page for 2nd Lt Jones on our new website you can see a picture of the trees. This gift became even more poignant following the events in Paris the previous evening. If you follow this link, Listen now you will see a picture of Rainhill Hall (Loyola Hall) and be able to listen to a Radio Merseyside item recorded by Anne Slater and Ann-Veronica Howitt about Princess Blucher. Link courtesy of BBC Radio Merseyside. Please note that visitors from outside the UK may not be able to access the BBC site which carries this extract. Just launched is our second website rainhillremembers.uk, which is the result of three years of research into the men of Rainhill who served in the Great War. There is much more to see on the site, including details of the war hospitals in the area and the story of the Brethertons of Rainhill Hall. You can easily find details of casualties and survivors by following up a name. We are most grateful to the people within and outside the Society who carried out the research and set up the site. Thanks, too, to those who provided the invaluable historical material featured there. Click on the picture to have a look at it. On Saturday, 14th November in the St Ann's Centre we are holding an exhibition about the Great War. Although not as comprehensive as last year's, it will have plenty to interest everyone who wants to know more about Rainhill's part in the war. There'll be a hands-on demonstration of the new website, too. Members of the Society, councillors, representatives of the Services and our MP, Marie Rimmer, took part in a ceremony on Sunday morning, 20 September. This event commemorated Lt Jones , who was shot down in France in 1918 and it also cemented the twinning arrangement with Latour en Woevre, where he is buried. A ceremony was also held in France on the same day. Rainhill has new boundary signs to celebrate the twinning. Presentation of awards to winners of Rainhill in Bloom followed by �The Rise and Fall of the White Star Line�. Peter Elson, a retired Liverpool journalist, tells the gripping story of the line�s pioneering place in ocean travel. Here is a history page about the White Star Line. Saturday October 15th. Coffee Morning. 10am to 2pm in the St Ann�s Centre. �The Brethertons and Loyola Hall�. Pauline Hurst. A one day historical course by Alan Crosby at the Victoria Hotel. 10.00 am to 4.00pm. Contact the Society to reserve a place. Numbers are limited � first come first served. A member of the St Helens Townships Family History Society, Dave will describe the founding of this local regiment and will follow its time through the Great War and beyond. The St Helens Pals website is here. Kevin Dickinson will challenge our knowledge for a second year. Small charge for festive refreshments. �The Lettuce Line�. Keith Hick. Keith will bring to life the workings of this west Lancashire railway line which lasted from 1878 to the Beeching closures in 1964. �SSAFA �The Armed Forces Charity�. A representative of the organisation will give an insight into SSAFA�s work with working age veterans, active personnel and their families. This is SSAFA's website. Part 2 of Alan Crosby�s course. Formerly known as �English Heritage�, this organisation works to preserve listed buildings and monuments. Here in Rainhill work has been done to preserve St Anne�s Well. (We are liaising with Historic England to arrange a walk to the Well for our members - if practical conditions allow. Details will be posted on the website.) Find out about Historic England. Annual General Meeting. Details to be confirmed. Coach trip to the National Memorial Arboretum. Times from/to Rainhill are 9-15am to 5-30pm. Cost is �13. Tickets will be available from the Society (at meetings or from the website) from January 2017 - first come first served - priority to members. This date has been changed from the 24th. Thirty nine people joined us at September’s Rainhill Remembered Meeting, including four former residents of Rann Lea. Shirley Wylie from Aberdeen exchanged memories with Mike Roberts whose grandparents, Mr & Mrs Wood, used to own the property. He brought along some photographs. Muriel Hughes aged 94 also came to the meeting with her son, Roger. They lived at Rann Lea in the 1940’s. The mansion was built in 1862 for a wealthy chemical manufacturer from St Helens called John Marsh. It was originally called Beaconsfield. It is not clear when the name changed. Can anyone tell us? At our next meeting on Tuesday 13th October, we will be focussing on Loyola (formerly Rainhill) Hall and its past occupants. Has anyone a good story to tell? You will be very welcome. Drop in at St Ann’s Millennium Centre between 1pm and 3pm. All the details of our season of meetings, starting in September, can now be found on the "Events" page of the site. Plenty to look forward to. Here in Rainhill, on Stephenson's pioneering railway, you can now hear the hum of electric trains. But, sometimes, you can catch a sound from railways past. Sunday, 19th July, was one such occasion as the steam locomotive "Gallatea" passed through the station on its way to Wales. This was the sight, electric overhead wires and all. Members of the Rainhill Remembered Tuesday group ended the season in style when they treated themselves to a strawberry tea at Galleria, a restaurant and art gallery in the Village centre. The building that now houses Galleria is remembered by many as the sweet shop where they spent their pocket money. The next Rainhill Remembered meeting will be on the 8th September at the usual venue, the St Ann's Millennium Centre. Do drop in between 1pm and 3pm. Visitors are welcome. The group's everyday expenses, such as room hire at the Centre, are supported by a generous donation from the Rainhill Gala Committee. Here we are again. We had our usual stall at Rainhill Gala on Bank Holiday Monday. Here are some of the committee on duty. Another season ended The AGM on 28th April marked the end of our very successful 2014-15 season. Sheriff marks the way. What do grease, road markings and formal uniforms have in common? The answer is Ian Meadows, OBE, DL. This we learned at the Rainhill Civic Society meeting on 31st March. Mr Meadows is a descendant of the founders of a nineteenth century Rainhill firm of tar distillers. After much tribulation, the firm became R S Clare, a successful company in Liverpool, which still exists and makes, among other products, grease and the compounds used to mark out roads. The uniform? Mr Meadows spent a year as High Sheriff of Merseyside, attending many events in his formal uniform. He said he was very impressed during his year at the number of 'unsung' volunteers who bring such benefit to their local communities. And DL? That stands for deputy Lieutenant, also of Merseyside. All meetings are held in the St Ann's Centre, View Road, and start at 7.30 pm. Friday and Saturday, 26th and 27th September. �Rainhill Remembers�.the First World War�. A community-wide event in St Ann�s church from 10 am to 4pm each day. Follow the WW1 tag above for more details. Tuesday, October 7th. �Belgium to Bari�. Dr Chris Mimnagh. Dr Mimnagh recounts his recent journey from Belgium to Bari in the footsteps of family members who fell in the Great War, using a video diary, digital slide show and anecdotes from his journey. Tuesday, January 27th, 2015. �Port Sunlight Village�. Sylvia O�Malley. Sylvia is Blue Badge tour guide. Her talk on Port Sunlight, home of the Lever Brothers� soap factory and of pioneering accommodation for its workforce, will give an informed view of Britain and this premier social housing project in the nineteenth century. The Port Sunlight web page. Tuesday, February 24th. �The Mersey Gateway�. Members of the project team will describe the new six lane toll bridge over the Mersey, due to open in 2017 to relieve the congested, ageing Silver Jubilee Bridge. Have a look at the official site. Tuesday, March 31st. �The Meadows Family�. Ian Meadows OBE DL. The Meadows family lived in Rainhill in the 19th century and owned a tar distillery. Ian heads a family owned business which has operated for generations in Liverpool. He recently held the office of High Sheriff of Merseyside and he will give us a snapshot of �day in the life� of a High Sheriff. This is the web site of the current High Sheriff. Tuesday, April 28th - AGM. After the business part of the meeting �What�s been happening this year�. Illustrated presentations by committee members to show what the Society has achieved over the past twelve months. All meetings at 7.30pm in the St Ann�s Centre, unless otherwise indicated. Entry is free. 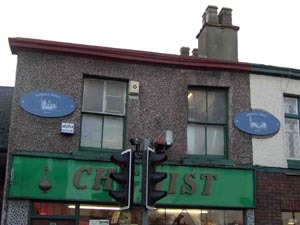 The Centre is at the corner of View Road and Warrington Road and has free parking. Saturday, September 21st, 2013, 10am to 4pm. Heritage Event at the Victoria Hotel. Historic displays and guided walks. New calendar for 2014 on sale. Presentation of Rainhill in Bloom awards at 2.00pm. Gary Conley - "Dream". Gary will present an update on "Dream" and the planned development of the site. He will also deliver a guided walk for Society members on Sunday October 6th, time and meeting place to be arranged. Stephen Nulty � �Fallen Heroes from Prescot and Rainhill in World War I�. 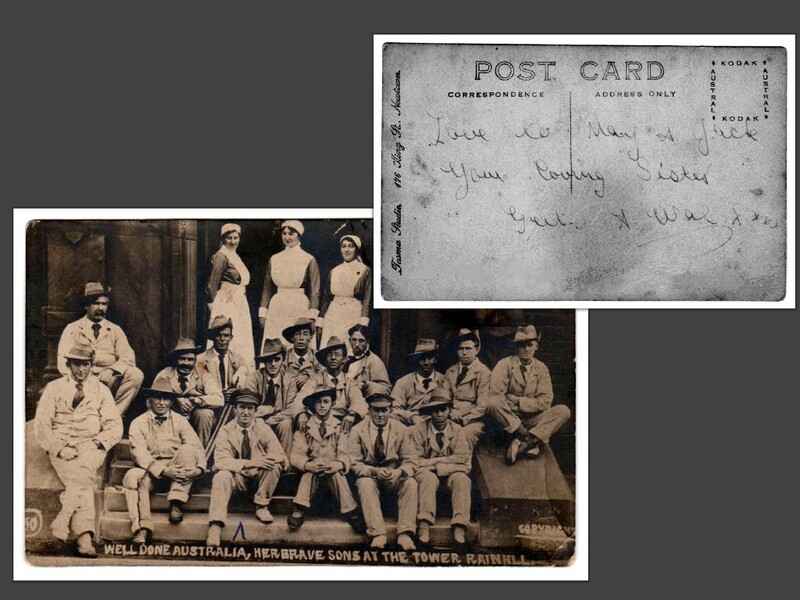 Stephen will deliver an informative talk on his research into local men who went to war. June Patten � �The Amish Community of the USA�. - a fascinating insight into the world of this unique community. John Fairclough � �St Ann's Lych Gate �. John, local photographer and Society member, will deliver an illustrated talk on the recent refurbishment of the Lych Gate. Tom Preston � �The Deeming Murders�. Tom will give us an intriguing report on the notorious Mr Deeming and his links to Rainhill. Tuesday, April 29th - AGM . Michael Murphy � �Muck and Money in 19th Century Manchester�. Michael will entertain Society members with a talk on life in the 19th century. Connections to Rainhill will be a feature of his talk. AGM 2013 The AGM went well, with the usual cast of characters being elected to various posts. We would still very much welcome any volunteers from among the membership to join the committee. After the business part of the meeting Andy Perry, a Rainhill resident, gave an extended repeat of her talk about the Round the World Clipper Race, in which she took part. For those of us who go pale at the thought of crossing the Mersey, spending weeks at a 45 degrees angle in towering seas verged on the heroic. But she survived to tell a very interesting tale. Very unseasonable weather for March meant a good covering of snow in Rainhill. Other parts of the country were much worse, though. And to think that at the same time last year the temperature was about 20 C and a drought was expected. The pictures show the Village on the morning of March 23 2013. (Spring 2013)If you've been over the Skew Bridge recently you will have seen that work has been completed in raising the height of the parapet on the station side. These are two pictures of the work in progress. 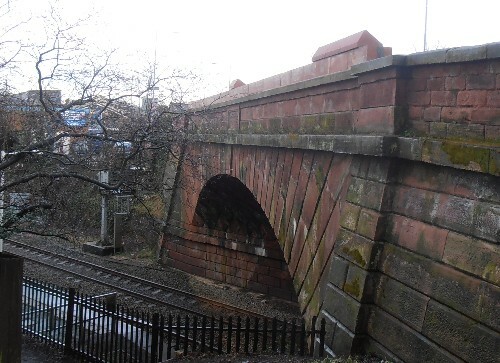 The bridge is a listed structure and the Society was concerned about the effects of the changes needed in order to comply with regulations connected with the forthcoming electrification of the line. At present, the new stone looks very raw but, inevitably it will tone down with age. The bridge was built when the pioneering Liverpool-Manchester railway was first constructed, and is the first of its kind. (Sept 2013) The Planning Department has now accepted that modifications should be made to new stonework and more work will be done to match it to the original materials. We now have a page on the site just for ex-Rainhillians to get in touch with each other. So many people have emailed us about their time in Rainhill that we thought we should have a contact page. You can go to it at Rainhill Remembered. All meetings are held in the St Ann's Millennium Centre and start at 7.30 pm, unless otherwise stated. Saturday, 22nd September, 10.30 am to 4.30 pm. Heritage Day at the Victoria Hotel. Celebrating Rainhill�s Victorian past and the Victoria Hotel�s links with Rainhill�s history. Historic maps, photographs and slideshows. Art Exhibition. Chidren�s activities. Open to the public. Free entry. Please tell your friends. Join in the fun by dressing in Victorian costume. 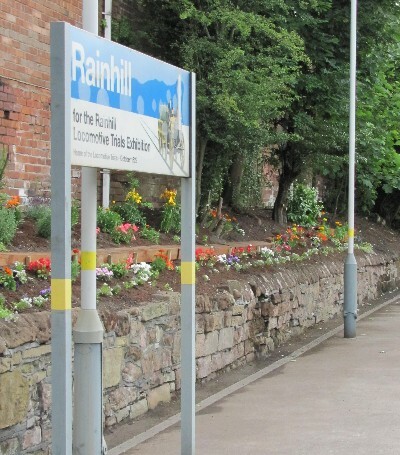 The presentation of awards for Rainhill in Bloom will take place during the day. �Under the Hammer.� Peter Ashburner, a Knutsford auctioneer, will be relating tales of the auctioneering world, and will bring examples of his stock in trade. Mr Ashburner is a grandson of a former Vicar of Rainhill. �Keeping the Flame Alive.� Mike Dooling, Olympic torch bearer, sports enthusiast and �Chariots of Fire� extra, will share his experiences of a lifetime in athletics. �Paths of Glory.� Ted Forsyth, Treasurer and Archivist of the Friends of St Helens Cemetery, will bring to life the stories of some legendary St Helens characters who are buried there and will describe the group�s work in the preservation of Windleshaw Abbey. �Garswood Hall � our own Downton Abbey.� Tom Preston returns to describe the history of this ancestral home of the Gerard family. The Hall is long demolished and its site now forms part of the Ashton Golf Course. �Southport Offshore Rescue Trust.� In this talk, postponed from last season, we will hear about the work of a vital organisation which is independent of the RNLI. Tuesday, 23rd April. Annual General Meeting. After the brief business meeting Andy Perry will again give us her striking presentation about the part she played in the round-the-world Clipper Race. John Moss of Otterspool in Liverpool is not a name that springs immediately to mind when the world famous Liverpool-Manchester railway is mentioned. Yet he was vital to its success. Graham Trust, in his talk on January 31st went as a far as to say that without Moss's financial and business acumen the whole enterprise might never have happened - and world transport history might have been very different. But John Moss was influential in other fields too. As a slave owner in Demerara (in present-day Guyana)and a significant sugar producer, he was active in the improvement of working conditions and instrumental in the eventual abolition of slavery itself. Graham's talk, which he felt was very apt in Rainhill, in a building a few hundred yards from the site of Stephenson's success with the Rocket, was attended by this season's biggest audience. Unfortunately there had to be a change of programme for the meeting on 6th December, as the advertised speaker was unable to be present. Instead of hearing about the Titanic, the audience listened to Mike Carter, a former Chairman of the Society, talk about his 60 years in public service. As a chief executive of a local authority, Mike was privy to many decisions whose effects are still evident, and he had anecdotes to tell about well known figures in public life. The evening closed with wine and mince pies. Our 1940s event, held on 5th November, 2011, was a great success. Well over 700 people came and they were able to see tableaux of typical rooms of the 40s. Members of the Society even dressed in the styles of the time. There were full houses at all three showings of "Smiling Through" the audio-visual presentation with sound recordings and pictures of Rainhill people's war time memories.You can see some pictures taken during the day by following the "1940s" link at the left of this page. Vikings were not as bad as they are painted. Linda and Sonnie Sa, of the Wirral Vikings Society, taught us a lot about the Vikings when they spoke to the Society on Tuesday, 25th October. Although Viking men were an agressive bunch when abroad, at home they were ruled by the women. Viking society was, nevertheless, a partnership between men and women, but everyday life revolved around decisions made by women. Linda drew parallels with modern day attitudes, and teased today's men with talk of their inability to multi task and blinkered single mindedness. In Viking times these attributes were vital to the protection of the community and the nurturing women depended on the macho men to keep families safe. Vikings brought to Britain much of our culture and many of our customs. The first Parliament was a Viking one in Wirral. Although the Society is hugely concerned with life in Rainhill now, we also have an interest in what happened here in the past. On Saturday, 5th November we will be giving a taste of life in the 1940s, with an exhibition in the St Ann's centre from 10 am to 4 pm. Everything from weddings to domestic memorabilia will be depicted through objects lent to us by local residents. There is free entry and light refreshments. 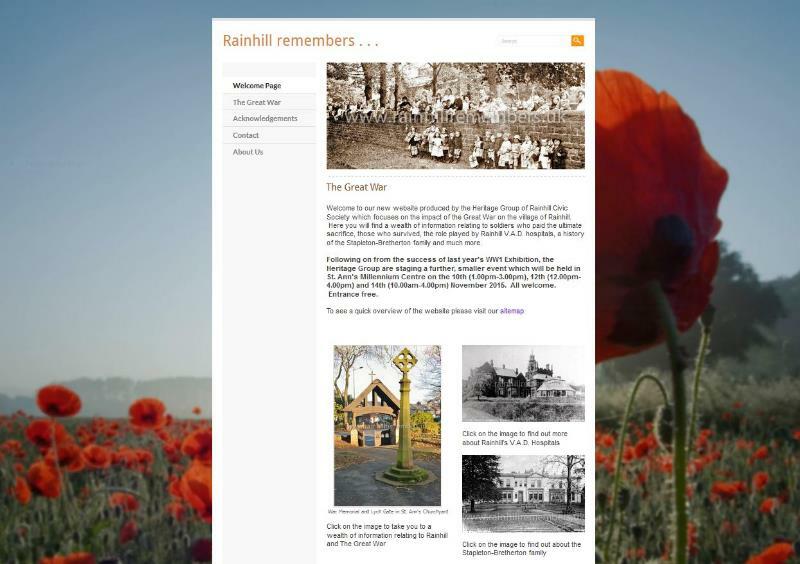 Take a look at the "Rainhill Remembered" pages if you've not been there recently. You can now search an index of those who have contributed, so finding long-lost friends is much easier. And speaking of memories, our Tuesday afternoon series of get-togethers starts again on 13th September at 1.30 in the St Ann's Centre. They happen every second Tuesday of the month. A cup of tea and a chat about Rainhill is what it's about. We've learned a lot about the Village since the first one last February and your memory might be just the one to trigger off a new line of thought, so come along if you're in Rainhill. This year's winner was Linda Whittle. Second was John Atherton and joint third were entries from Janet Bowen and Ray Rigby. You can see pictures of the winning gardens by clicking the link on the left. Tuesday, September 27th, 2011. Rainhill in Bloom Presentation. Followed by"Who Do You Think You Are?" Ancestry expert, Mike Royden, talks about family history. Also in September a repeat of last year�s history course will be held on 15th and 29th at Manor Farm. Tuesday, October 25th. "Wirhahl Skip Felag (The Wirral Viking Society" Everyday life in Viking times, with Linda and Sonnie Sa. Go to the Viking Society's Facebook page. Saturday, November 5th. �Rainhill Remembered - the 1940s�. A free exhibition showing typical domestic scenes, photographs, clothing and memorabilia from the period. Open to the public from 10am to 4 pm; light refreshments. Tuesday, December 6th. �The Titanic Disaster, 1912�. Ken Pye provides an introduction to next year�s centenary. See some background about the ship. Tuesday, January 31st 2012. �John Moss of Otterspool�. Author Graham Trust talks about this fascinating character, who was a slave owner and also chairman of the Liverpool-Manchester railway. Find out about Otterspool House, and its history. Tuesday, February 28th. �Whiston Hospital Chapel�, a talk by Donald Sutcliffe. The now- demolished building contained stained glass donated by the Stapleton-Brethertons. Tuesday, March 27th. �Southport Offshore Rescue Trust�. This organisation, independent of the RNLI, will be the subject of John Shawcroft�s talk.See details about the charity. Note (January 2012) Unfortunately, John Shawcroft will be unable to give this talk. We are in the process of arranging an alternative speaker. Details will be posted here as soon as we have them. Tuesday, April 24th. AGM followed by a review of the full year�s activities and an opportunity to look at the Society�s web site, including contributions from contacts all over the world. Exhibition and preview of the book, �Rainhill�s Past in Pictures�, for members only. The book will have its public launch on Saturday 18th September. Rainhill in Bloom Presentation. 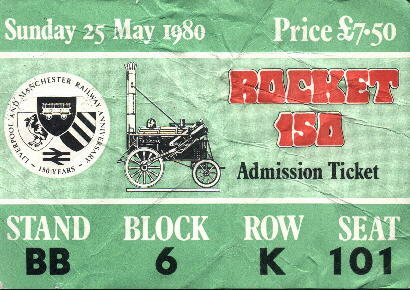 Followed by �Rocket 150�; how Rainhill celebrated the 150th anniversary of the Locomotive Trials. A DVD version of the original 1980 audio�visual show, by courtesy of Alan Jones. �Quilting is Alive and Well�. A talk and display of quilts by Society member Ann Davey, and friends from the Bridge Quilting Group. �The History of St Helens�. An illustrated talk by Chris Coffey, columnist in the St Helens Star and secretary of St Helens Heritage Network. "My Photography". Professional wildlife & natural history photographer John Fairclough, a Society member, will show his stunning images and talk about his work. A two day course led by Dr Alan Crosby about the history of Manor Farm, to be held at the Manor Farm pub. Further details will be supplied in October. AGM followed by �Rainhill Remembered�, a picture and sound archive of Rainhill memories, produced by the Society as part of our ongoing Heritage Project. Visit to Fir Tree Farm, Kings Moss. Full details will be available in the new year. Like many town centres, Rainhill Village has a parking problem. Restrictions on the existing car parks and lack of extra space has led to a rash of on-street parking, to the annoyance of many residents. As a Society we have long felt that this problem was contributing to a lessening of trade in the Village centre, to everyone's disadvantage. Our committee recently met with ward councillors from St Helens Council for an exchange of views on the matter. The councillors assured us that they were conscious of the problem and that they were making every effort to resolve it. As usual, the Society will be holding a programme of talks throughout the autumn and winter. Following the book launch on 18th September, the October meeting will be the presentation to the winners of Rainhill in Bloom. Afterwards, there will be an opportunity to see a DVD version of the1980 audio-visual record of "Rocket 150", Rainhill's celebrations of the 150th anniversary of the Rainhill Locomotive Trials. This DVD has kindly been made avaialble by Alan Jones and is, itself, an evocation of the late 1970s. 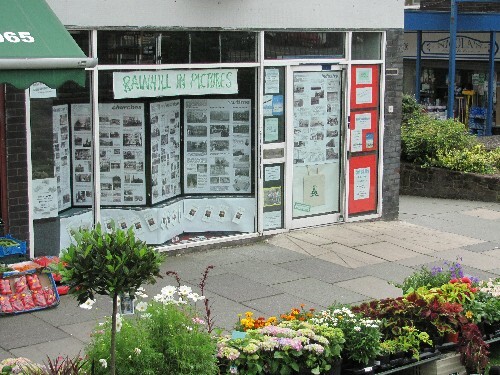 An empty bank building in the centre of Rainhill has been put to temporary use by the Society to show the display boards used in last year's exhibition. The display is proving to be an interesting talking point for passers by, as well as giving plenty of publicity for the new book. 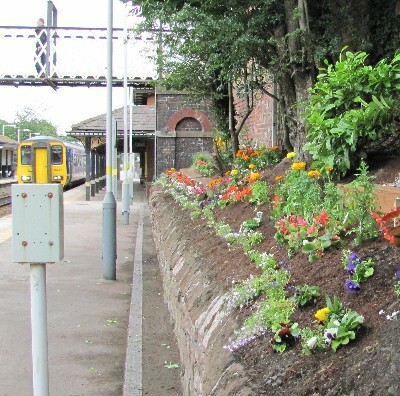 Although improvements to Rainhill Station are still under development, Northern Rail have recently provide a small garden, which has certainly brightened up the station for passengers and residents. At our AGM on 27th April, 2010, Gary Conley, one of the moving spirits behind St Helens's famous public art work, Dream, gave an interesting talk about the project's beginnings. As at all our recent meetings, there was a very large attendance. That was the final meeting of the season. Grade II status has been awarded to Bourne�s Tunnel. This is a narrow tunnel underneath the railway, some distance from the village centre. In the 19th century,it carried a tramway which linked the Elton Head colliery in Sutton with a weighing machine and coal stockpile on the Liverpool-Warrington turnpike road, near to the present day Ex-Services club in Warrington Road The tunnel is more than 100ft (30 metres) long and is at an angle to the railway, showing skewed stonework, like the more famous and much larger Skewed Bridge It is not known who designed the tunnel, but it was constructed in the late 1820�s as part of the world�s first railway. Derek Houghton, Chair of the Rainhill Railway and Heritage Society, and one of our committee members, has described it in the local paper as follows. : "When the Liverpool and Manchester line was built this tunnel was created to accommodate the tramway. Soon afterwards, the rail line took the coal instead, but it's still very good news that it's been listed. Simply because of its age it deserves to be listed because the tramway was there before the rail line." 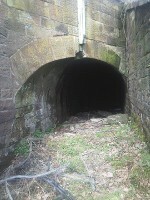 The tunnel is on private land and cannot be accessed by the public. On 23rd March, Dr Richard Barnes, a psychiatrist, spoke to the Society on a subject we've not covered before. Although his talk was centred around the long demolished Rainhill Hospital, once claimed to be the largest mental hospital in Europe, Dr Barnes gave a graphic description of the conditions prevailing in 19th century Liverpool private "lunatic asylums", before an act of Parliament established county asylums. He also showed that the very detailed records kept at Rainhill Hospital more than a hundred years ago enabled modern techniques to be used to diagnose accurately the conditions of patients at that time. In overall terms, the proportions of many mental conditions have hardly changed over the years. Fortunately, treatments have. The Society has been in the running for awards recently. On 26th February, Anne Slater, a very long serving member, twice chairperson and one of the powers behind our sucessful exhibition, was one of the recipients of Rainhill Parish Council's Good Citizenship awards. The next evening, Anne and other committee members represented the Society at St Helens Council's Cultural Awards. Though nominated for the heritage section, unfortunately, they were not called upon to give any tearful acceptance speeches. The very impressive event was compered by Dianne Oxberry, a presenter on local television and addressed by Mike McCartney, photographer and performer, a man with a fairly famous brother. Roy Medlicott really was the last lighthouse keeper, and on January 26th he gave a very absorbing talk about his time in the service. 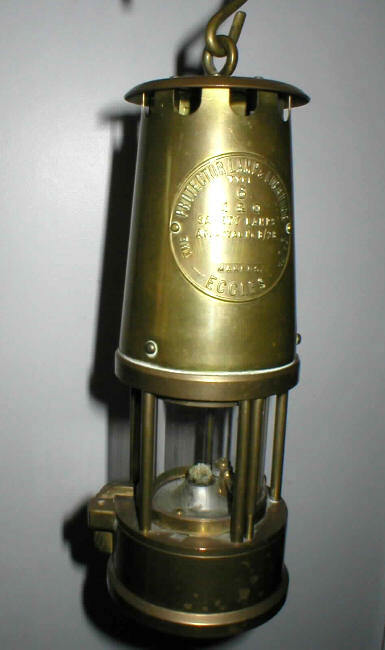 While shore-based lighthouses were relatively comfortable and convenient, those many miles out at sea were far from it. Banana shaped bunks, cramped space and primitive sanitation were common. Getting to and from work was no simple commute, even in good weather, and was impossible in a storm. A keeper had to be resourceful, patient and practical. The coming of automated lighthouses was inevitable, but brought some sadness at the end of a way of life. After the presentation of the Rainhill in Bloom awards on October 27th, by Councillor Kelly, members and visitors were treated to a talk by Michael Murphy on "Famous Courtesans of the 18th to 20th century. We heard that these ladies were more than mere decoration and many played a crucial role in the politics of the times. Michael left us with the tantalising thought as to who are today's equivalents. The exhibition of "Rainhill's Past in Pictures", held on the weekend of 12th and 13th September 2009, was a great success. Including those who went to a preview for Society members, the estimated attendance was in the region of 1500 people. One 80 year old ex-Rainhillian came from Sussex especially to see it and there were visitors from Canada and Australia. About 120 local school children visited the exhibition later and other schools expressed an interest. Although the Society is not in a position to satisfy the many requests for copies of the pictures, most of which were only loaned to us, we do intend to produce a book which will contain many of them. "Rainhill's Past in Pictures", a major exhibition of pictures and memorabilia. A two-day exhibition in the Millennium Centre from 11 am to 4 pm each day. This will be followed n by "Famous Courtesans of the 18th to 20th Centuries", an intriguing talk by Michael Murphy. Jenny Hall of Fir Tree Farm, Kings Moss, talks about eating responsibly. Speaker yet to be confirmed. Gordon Medlicott speaks about the end of a way of life. The Leyland Family at Speke Hall. A talk by Peter Herriman. Dr Richard Barnes describes one of Europe's largest mental hospitals. The brief AGM will be followed by an interesting talk about Dream, the startling work of art at Sutton Manor which was the highlight of Channel Four's public art programme. Gary Conley, one of the originators of the scheme, will speak. 2008-09 Notes of meetings and news items of the time. The Rainhill community took advantage of the Bank Holiday sunshine at the annual Rainhill Gala, held on St Ann's school field. The Civic Society shared a stall with the Rainhill Railway and Heritage Society and it all went very well. You can find a link to the Gala web site here. Awards logo The Society is pleased to announce that, in connection with the exhibition detailed below, a successful bid has been submitted to "Awards for All" and a cheque for �9,950 has been received. This sum will be used to support the exhibition's practical costs as well as providing equipment and training, so that even more information about Rainhill's past can be collected in a variety of formats. Plans are now well underway for the Society's major exhibition of pictures and memorabilia from old Rainhill, to be held in September in conjunction with Heritage Open Days. A lot of material has been received but more would be welcome. Please get in touch with the Society via the contact page if you have anything to offer. All documents will be returned and copies made if you prefer. Meanwhile, Anne Slater and Judy Lowe, the organisers can be seen here with some of the pictures already submitted by residents and former Rainhillians. A Farm and a Priory The February and March meetings again attracted good attendances.Damien Young told us about the countrywide scheme to develop wild flower refuges throughout the country and about plans to grow the seeds for the scheme at Inglenook Farm in Rainford while, in March, Cathy Williams gave a detailed history of Norton Priory. All at sea Those who are sea-sick crossing the Mersey were full of admiration on Tuesday 27th January, when Andy Perry described her round-the-world sailing adventure in the Clipper Race. Starting as a complete non-sailor, she acheived a high degree of competance in everything from navigation to making porridge in a heaving, bucking galley. After showing members a polished DVD of the race Andy answered questions about her own experiences and left her audience both envious of her spirit and grateful that they were off home to a stationary bed. Launch of Virtual Museum. In January, 2009, St Helens Council launched a virtual museum about the Trials, which gives interactive access to pictures and information about the event and its surrounding circumstances. This is the first stage of the project to establish a permanent Museum as a replacement for the current exhibition in the Library. 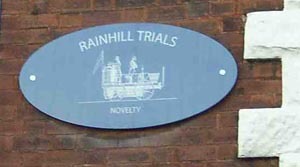 Visit rainhilltrials.com and see what you think of it. People in Rainhill were very saddened to hear of the death, on December 30th, of Councillor Mike Doyle. Mike was a Vice-president of the Society, but was also widely known as a vigorous advocate for Rainhill in his role as a borough councillor. As part of these duties, and as a long serving member of Rainhill Parish Council, he was active in promoting many of the facilities now taken for granted by residents.The Civic Society and the people of Rainhill will be the poorer for his passing. When Alan Richardson said he would be basing his talk on recently discovered papers and documents we hadn't expected him to bring most of them with him, but it seemed like that in November when he talked about the Owen family. Thanks to the generosity and foresight of the late Richard Welsby, Alan had original account books and verbatim copies of letters going back to mid-Victorian times. Using these he was able to paint a vivid picture of the family's life and business dealings. Some of the prices he quoted for property and effects were startling in terms of today's money. The Owens were great builders and many of their houses are still lived in today. They also donated land and materials for St Ann's church and the school, now the Millennium Centre. Rainhill in Bloom Winners Mr Matt Gilsenen, of Mossdale Drive is the winner for the second year running. In second place were Mr and Mrs Peter Woods of Old Lane, while Mrs Margaret Doyle, of Warburton Hey came third. Mrs Doyle is also a previous winner. An entry that was ineligible because it did not fall into the category of containers or baskets came from Mr Kevin Wilks. The residents of Park Avenue have set up a planting scheme in the alleyway behind their houses, with some finacial assistance from the Council. Their work has made a big difference to the space to the benefit of all. The competition judges were extremely impressed by the scheme. New Season's Programme The details of the 2008-09 programme of talks have now been finalised. You can look forward to hearing about the work of Lord Derby's Stud Manager, the life and times of the Owen Family, Rainhill's Victorian benefactors, and the work of the Northwest Air Ambulance. A local crew member from the round-the-world clipper race will tell us some sea-farer's tales and we'll hear about a new project to grow essential oils and provide a wildlife haven in Rainford. Finally, we'll get to know a bit more about Norton Priory. Full details are on the programme page. 2007-08 Notes of meetings and other news of the time. AGM and a walk in the park After the usual business of the AGM Bob Dutton, Chair of the Friends of Court Hey Park, and his colleague Dave Roberts gave a fascinating talk about the park. Formerly the a home of the Gladstone family, the park has been rescued from disrepair and returned to the community. As well as being home to the National Wildflower Collection, the park provides pleasant leisure facilties and a breath of the countryside in the city. Do look at the park's web site. It's no longer a tip Duncan MacNaughton spoke to the Society on March 18th about the parkland developed on the site of the old Sutton Manor colliery. What was once a pithead and spoil heap is now a thriving nature reserve and public space. Visitors have come from all over to see this example of the reuse of derelict land. The site is at the edge of open country, with views stretching from the Pennines to the Welsh hills, and adjoins the M62 motorway. The Trolley Song If you ever went on a St Helens trolley bus, not only does that make you of a certain age but you'll remember them with great affection. Geoff Sandford, who spoke to the Society on 26th February, certainly had that affection. In fact, he's written a book about trolley buses and his illustrated talk covered all forms of public transport in St Helens over the years.The soundtrack of a DVD about the trolley buses brought back that characteristic sound we all heard as they accelerated along Warrington Road in the first half of last century. Pity the infrastructure wasn't properly maintained and they had to go, claimed Geoff, as they never lost money and other towns across the world seem to have kept them running. An early bath Our first meeting of 2008, on January 24th, consisted of a talk about the Victoria Baths in Manchester, by Neil Bonner. The baths were featured in the BBC programme "Restoration", but despite its winning the contest a large sum of money is still needed to complete the work. Neil gave a very full account of the baths, describing its place in the social history of Manchester, its current use as an art venue and the exciting plans for further refurbishment. We were fortunate to have in the audience a woman who had swum in the baths as a schoolgirl, and who could add her own stories to the talk. More Rainhill HistoryDr and Mrs Dickenson, the historians who wrote the Society's series of booklets in the 1960s and 70s, were prolific in their research. "The Story of Rainhill", updated and republished in 2004, was intended as the first of a series of historical records of the township. They left a mass of unsorted material which, until recently, has been housed at the Lancashire Record Office in Preston. Now, Anne Slater, currently Chair of the Society, has rescued the documents, whose many boxes are occupying her spare room as she attempts to put them in some sort of order. While no plans have yet been made, the Society would like eventually to publish them in some form. Briars Hey Passions have been high in Rainhill over the proposed conversion of Briars Hey, a grade II listed building, into a facilty for women with mental health problems. Letters to the local press and several meetings of concerned residents have given vent to strong feelings for and against the proposal. The Society has put forward views on the effect of the development on the building itself and on its setting. The Society was instrumental in pressing for listed status some years ago. Representatives of our planning sub-committee have attended meetings with residents and the developer. At the end of April the application was withdrawn, but it will be replaced with a new proposal for a similar scheme on a smaller scale. Charles Rennie Mackintosh On Tuesday, 6th November Pat Marsden gave a fascinating talk about this designer, architect and painter. Pat runs an internet company in St Helens which sends reproduction items based on his designs to customers all over the country, items ranging from chairs to ear-rings. Among other surprising facts, we learned that the distinctive tower of Liverpool Anglican cathedral is based on a design by Mackintosh, incorporated in the winning architect's plans. Dr Vera Giles Members of the Society, and many other residents of Rainhill, were saddened by the death in September of Vera Giles at the age of 93. Vera had been a long serving committee member but is fondly remembered as a GP in Rainhill. She had treated several generations of some families. The Society plans to plant a tree or shrub in her memory. A request for information Do you know anything about the men whose names appear on the War Memorials in Rainhill? The Vicar of Rainhill is hoping to gather as much information as he can so as to build up a picture of those who are commemorated there and to identify any surviving relatives. You can contact The Rev. Nicholas Anderson at the Vicarage (0151 426 4666). If you wish, you can use our "Rainhill Remembered" page to send any information you might have and we will pass it on to Mr Anderson. Rainhill in Bloom. Mr Matt Gilsenan was the winner of the 2007 contest. You can see a picture of the presentation and a list of winners by going to the Rainhill in Bloom page. Following the presentation at the meeting on 25th September, Rosemary Tyler gave an informative talk about life in Elizabethan Prescot. She also spoke with great enthusiasm about the current project to construct a replica playhouse in the style of one believed to have existed in the town then. There is some evidence that Shakespeare visited the playhouse through his connection with Lord Derby, who lived nearby in Knowsley Hall.The new theatre, for which an application has been made for a GBP20 million grant, will be part of a fully equipped arts centre. A Bretherton in Rainhill. Audrey Ansell, a descendent of the Bretherton family and author of a book about them, visited Rainhill at the end of August. Audrey, with her husband and daughter, was visiting the UK from her home in New Zealand. The Society organised a visit to St Bartholomew's church, founded by Bartholomew Bretherton, and to Loyola Hall, which was built in 1824 to be the family home. 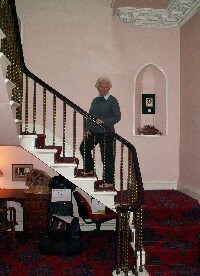 Audrey is pictured here on the grand staircase of the Hall. All meetings are at 7.30 pm in the St Ann's Millennium Centre, View Road, Rainhill. There is ample parking and level access. All meetings are open to everyone and are free. Please note there are no Wednesday meetings this season. Tuesday, 25th September, 2007 Presentation of the awards to winners of Rainhill in Bloom by the Chair of Rainhill Parish Council. This will be followed by a talk about the projected Elizabethan theatre in Prescot, given by Rosemary Tyler. Prescot was the site of one of the few free-standing theatres outside London at that time and it is thought that Shakespeare himself worked there. An ambitious scheme is underway to create a replica theatre and arts centre in Prescot, two miles from Rainhill. Have a look at Wikipedia's entry about it. Tuesday, 6th November. Charles Rennie Mackintosh. Thursday,24th January, 2008.The Victoria Baths, Manchester, a talk by Neil Bonner. Tuesday, 26th February. St Helens Transport, by Geoff Sandford. 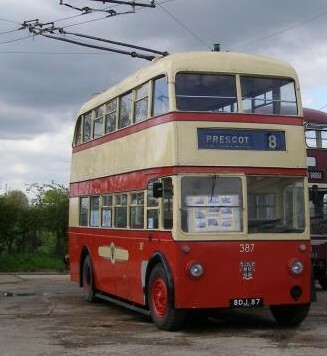 The recently opened Northwest Museum of Transport is located in St Helens and contains examples of a wide variety of local public transport vehicles. Visit www.hallstreetdepot.info to learn more. Tuesday, 18th March.The Forestry Commission. As well as housing the national wildflower centre, the park in Knowsley has an interesting history. Bob Dutton will tell us more. Look at the park's web site. Wednesday 27th September. Presentation of awards for Rainhill in Bloom by the Chair of Rainhill Parish Council. This will be followed by "A Natural History of Merseyside". Colin Twist will return to speak about local wildlife. Colin is a natural historian, writer and freelance lecturer who gave us an interesting talk a few seasons back on the creatures we can see around us in Rainhill. Last minute change of venue; St James Methodist Church, St James Road, in the church itself. Wednesday 1st November. "Capital of Culture 2008 - a St Helens Perspective". Liverpool will be the European Capital of Culture in 2008 and the award has raised a lot of interest within the city itself. But the surrounding region of Merseyside is expected both to get involved and to benefit from the year-long event. Gary Maddock, Tourism Manager, St Helens Council, will describe how the year looks from our point of view. (Did you know that Stavanger in Norway is also Capital of Culture that year? Thought not.) This site is the official Liverpool site about the year, but gives current information too. Wednesday 6th December. "Borneo". Cath and Keith Welsby show pictures of their latest journey. They are famed locally for their expertly photographed holidays and this one promises to be no exception. The official tourist site for Borneo. Wednesday 7th February 2007. "Pilkington Buildings in St Helens". Britain's most famous flat glass company, Pilkington, is now owned by the Japanese firm NSG but it began here in St Helens in the 1800s. Its famous float process is the basis for most of the building and automotive glass made throughout the world. Many of the buildings from the early days of the company still stand and Len Macdonald, former Pilkington Group Archivist, will tell us about them. Len is a Rainhill resident. Wednesday 14th March. "Preserving the Country's Written Heritage", a talk by by Neil Sayer, Senior Archivist, Lancashire Record Office. This is an appropriate follow-up to last month's talk. Records for the Rainhill area are lodged at the Record Office, including the original research by the Dickensons for our book "The Story of Rainhill". Click here for the official site for the Records Office. Wednesday 25th April. AGM followed by "The Williamson Tunnels". Stephen Moran will speak about the fascinating network of 19th century tunnels that lie beneath the Edge Hill area of Liverpool. The vast network of tunnels was built by Joseph Williamson for reasons which are not clear. One theory is that they were a work of philanthropy to help unemployed people. Much of the network remains unexplored but part of it is open to the public. The informative site of the Friends of Williamson's Tunnels. Pilkington Buildings in St Helens.The Pilkington glass firm was a very significant St Helens employer in the 19th and 20th centuries. It is only natural that the firm has left its architectural mark on the town. As well as the 1960s head office complex other buildings, ranging from the warehouses around Grove Street to the art deco building on the corner of Canal Street, still bear witness to the determination of the Pilkington family to make their mark. Len Macdonald, formerly Chief Archivist with the firm, gave an entertaining account of some of the buildings, and included pictures of scenes which are now history. Borneo Orang Utans and lots of children featured in the excellent photographs presented by Kath and Keith Welsby at our Christmas meeting on 6th December, when they described their holiday in Borneo.Treks through the jungle and trips by boat were also key features of their journey and a stopover in Brunei provided more pictures of interesting sights. This was yet another of Kath and Keith's exotic holidays and we look forward to seeing pictures of even more remarkable destinations in future seasons.The evening ended convivially with mince pies and wine. Tourism in St Helens On November 1st Gary Maddock, Tourism Manager for St Helens Council, talked about the area's potential for tourism in view of Liverpool's European City of Culture status in 2008. He said that St Helens was active in presenting the region as a desirable place to visit. Rainhill's unique connection to the development of railways was an important part of the council's thinking. New Season's Meetings Our first meeting on 27th September was held in the unusual setting of St James Methodist church. The winner of Rainhill in Bloom, Mrs Morrison, was presented with the trophy and runners up received their tokens and certificates. Colin Twist gave another of his encyclopaedic talks about local flora and fauna. Refreshments were provided in the adjacent hall. We are very grateful to the church for providing accommodation at short notice. Wednesday 28 September. Presentation of awards for Rainhill in Bloom by the Chair of Rainhill Parish Council. This will be followed by a talk by Steve Eccles,Transportation Section Leader, Halton B C about the new Mersey crossing www.merseycrossing.co.uk is a site that gives a lot of information, even though it is a bit out of date. Wednesday 2 November. "Hale Duck Decoy and Pickerings Pasture". Rob Smith, Head Ranger, Halton B C,will give a presentation on the newly restored keeper's cottage at Hale Duck Decoy, and about Pickerings Pasture. This site gives a very detailed picture of the duck decoy, a fascinating remnant from the past. Monday 5 December. Christmas floral demonstration by Fiona Griffiths. A practical demonstration of a centrepiece. Wednesday 15 March. "The Egerton Family at Tatton Park", by Rosalie Gorton. An entertaining talk about the residents of one of northern England's premier stately homes. Wednesday 26 April. AGM followed by "Stephenson's Wonderful Railway - passing the message on". Ann Marshall will tell us things we may not already know about our local claim to fame, the Liverpool-Manchester railway. Our own site covers this subject. The Woodland Trust exists to make sure that the trees we still have are kept in good order and that more are planted. The north west of England seems to be one of the least tree-covered areas in Europe and steps are being taken to rectify this. These were some of the points brought out by Paul Bullimore in his talk to the Society on 8th February. The Mersey Forest is one of the largest reforestation schemes currently being undertaken. In Rainhill itself St Barthlomew,s Wood is a project to preserve woodland on the site of the former Rainhill Hospital, to be used as a public amenity. Throughout the UK the Trust hopes to plant 12 million trees in their "Tree for All" project, one for each school child. Like other organisations in Rainhill the Society is participating in a review of the existing Conservation Area. We welcome the initiative of the planning officer Dr Waziri Sudi in his detailed examination of the area and we have made comments on the proposals set out in the review. Dr Sudi's address and email can be found on the St Helens Council's web site. 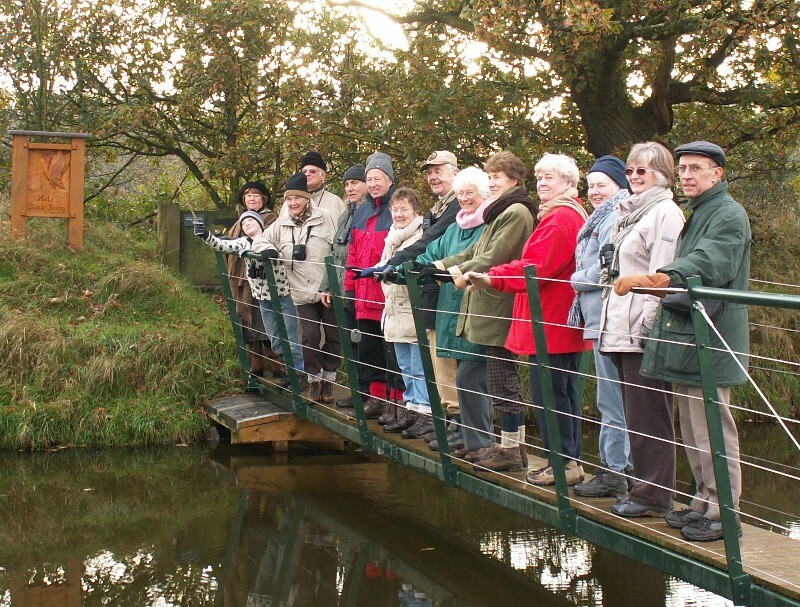 About twenty members took part in a guided walk to Hale Duck Decoy on Sunday afternoon, 20th November. In cold weather we walked from Pickerings Pasture to the decoy where ranger Rob Smith described the techniques used in earlier centuries to trap ducks. The picture shows members of the group crossing to the interior of the decoy. You can see a larger version by clicking on the image. Do you know Rod Hughes? 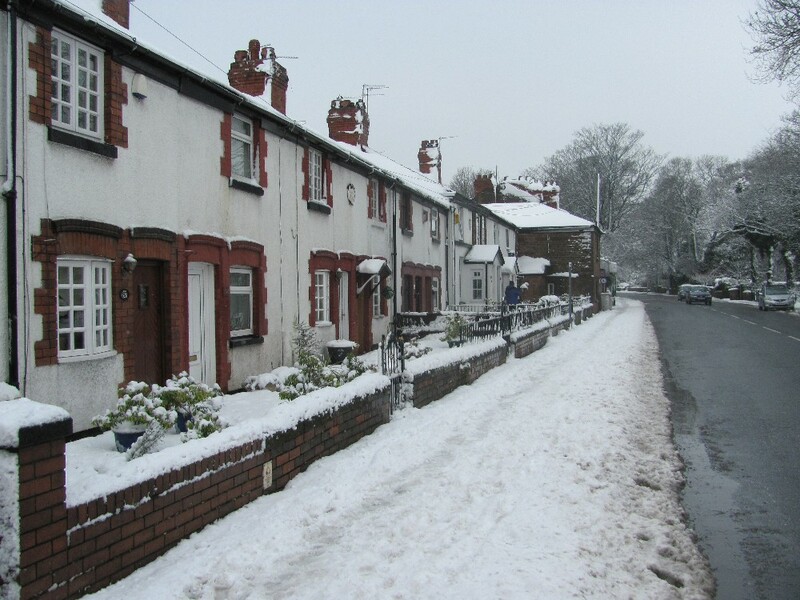 Rod, now based in Cardiff, lived in the Longton Lane area of Rainhill until 1970. He was born in 1943 and went to St Ann's school and youth club. Rod contacted the Society to ask whether any members might remember him. If you would like to get in touch with him email rainhill-civic@freenet.co.uk and we'll pass the message on. Last year's winner is, once again, Mrs Collette Wright. Runner up was Mrs Croft and third place was taken by Mr Andrew Gibson, another former winner. Presentation of the awards took place on Wednesday 28th September - see the list of winners for a picture of the presentation. This was followed by a fascinating account of the new Mersey Gateway, the proposed river crossing near Widnes. The victorian building in Mill Lane, Rainhill known as Briars Hey has recently received a grade II listing. This decision was made after pressure from local groups including our Society. The property, which had been used for many years by Lancashire County Council as a CHE residential home, is now on the market. The listed status has been welcomed by local bodies as a control over future development of the site. Members of the Society were saddened to hear of the recent death of Walter Smith. Walter was Chairman of the Society from 1994 to 1998 and also Treasurer for some years. He was a keen traveller, cricket watcher and was a lay reader at St Anne's church. Two observant visitors to the site have kindly drawn our attention to items which needed correction or improvement. Thanks very much to both of you. Peter, a former Rainhill resident, is in Australia; no idea of Bethany's location - but it's good that people are interested enough to point out our mistakes. The next series of meetings has now been arranged. Full details are now available on the "Programme" page of this site. Members can look forward to a talk about the new Mersey crossing in September, the Egerton family of Tatton Hall in March 2006, and our own claim to fame "Stephenson's Wonderful Railway" in April. Other subjects will be Christmas floral decorations, the Woodland Trust and wild birds on the Mersey marshes at Hale. This year's AGM was held on Tuesday,26th April at the St Ann's Centre. After the meeting David Innes, former Conservation Officer with St Helens Council gave an illustrated talk about historic and listed buildings in St Helens. A copy of the unconfirmed minutes of the AGM can be found here. At the March meeting of the Society Di Chappelle gave a graphic description of Jack the Ripper's activities and convinced her audience that he had been identified as John Maybrick, a Liverpool man who made visits to London on the appropriate dates. Maybrick's life in Liverpool was unusual in today's terms and involved the medicinal, or otherwise, use of poisons on a regular basis.The speaker dismissed other theories about the identity of the killer, especially that of Patricia Cornwell who, she said, had spent millions in a futile attempt to incriminate the painter Sickert. At the February meeting Anne Walton,a registered Blue Badge Guide, gave an illustrated talk about this famous building at the heart of Liverpool. The magnificent hall forms the centrepiece of what has been described as Europe's finest collection of neo-classical buildings. Its famous Minton tiled floor is so valuable that it is rarely seen, being covered by a wooden floor except for very special occasions. Like many old buildings, the hall is in need of funds to make good the effects of time and neglect. 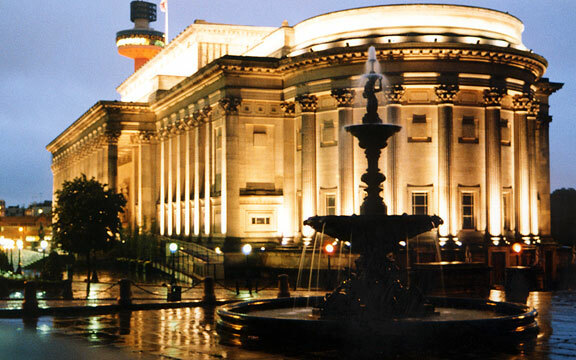 The Friends of St George's Hall organise events to raise money and publicise the building. Before the mince pies and wine at our Christmas meeting on 7th December members heard about the huge range of wildlife here in the Borough. Colin Twist, who is a serious and knowledgeable naturalist, described his systematic study and recording of birds, plants and insects in St Helens's woods and fields.The Sankey Valley Park, Carr Mill Dam and Stanley Bank were all sites brimming with interest. Many of the species of birds and insects visited from as far afield as Africa, while plant life, particularly on the Burgy Banks, contained some genuinely exotic varieties. Rainhill was not left out and Colin described his reclining in bed at home while watching such birds as jays and woodpeckers across the road. A joint project with Rainhill Rotary Club, aided by Rainhill Parish Council, came to a satisfactory conclusion in the last few days of November when eight of the village centre plaques, erected in 1979 to mark the 150th anniversary of the Rainhill Trials, were renewed. The new plastic plaques replace oval wooden ones which were clearly showing the effects of 25 years exposure to the elements. The pictures below show the work in progress and the finished effect. Members of the Society and the many others who knew her are saddened at the death on November 1st, of Helen Carns, a member of the Society's committee. Helen was active in many organisations in Rainhill. She was especially well known for her catering, which has graced many a buffet and meal in the area. Her funeral was held on 8th November at St Ann's church. The meeting on September 29th was a good start to the season. Councillor Catherine Kedge, this year's Chair of the Parish Council, presented prizes and certificates to the winners of Rainhill in Bloom. First prize went to Mrs Collette Wright, while second and third places were taken by John Evans and Janet Jones. The speaker later in the meeting was Don Sutcliffe, who gave an informed talk about the Liverpool Garden Festival of 1984. Rainhill's latest tree is not a tree at all. It's a mobile phone mast. When the planning application for a mast disguised as a tree was considered by our planning sub-committee we ridiculed it. But now it's there. It doesn't look too bad, but it stands out a bit now that the few neighbouring trees have lost their leaves. You need to look near the triangulation pillar at Blundell's Hill to see it. This year's AGM was held in the Millennium Centre on Wednesday, 21 April. About 30 members attended. You can read the unconfirmed minutes of the meeting by clicking here. After the brief business meeting Mrs Irene Rutter spoke about Lewis Carroll, the author of Alice in Wonderland and Alice through the Looking Glass. She based her talk on the window at Daresbury church, in Cheshire, which tells part of his life story in pictures. 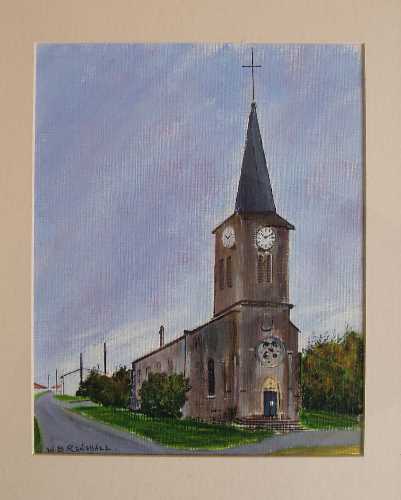 Carroll, whose real name was Charles Dodgson, lived in the village as a boy when his father was vicar there. Did you know that you shouldn't wear sweaty socks when you are handling bees? Or that the bees don't like smoke because of their inbred memory of forest fires? These were two of the facts passed on to members by David Thornton at the March meeting. David has been keeping bees in Rainhill for many years - although he takes his hives all over the place so that the bees can collect pollen and nectar from a variety of plants. He brought with him parts of a typical hive and in his slides illustrated the making of honey, from flower to jar. The sweaty socks? Bees don't show much interest in you if you don't smell - so the cleaner you are the less chance there is of being stung. Owing to sickness, the speaker for the meeting on 2nd December had to withdraw at twenty-four hours notice. Thanks to sterling work on the telephone by Gill and John Harris, we were fortunate in finding John Fairclough, who was able to fill the bill by giving an illustrated talk on his visit to the Falkland Islands. John won a wildlife photography competition and, much to his amazement, the prize was a 15 day trip to the islands, with opportunities to photograph the wildlife there. His pictures showed views of Santiago in Chile, a stop-off point on his journey, landscapes of the Falkland terrain and, of course, birds by the thousand. It was a long way to go for a few snaps but, being a serious enthusiast who took with him 200 rolls of film and a large rucksack full of expensive equipment, John made the most of his trip. There was a good attendance at the meeting. Those who came expecting pressed flowers and Christmas decorations were far from disappointed as they tucked into their mince pies and wine. On 4 November, the aptly named Rosemary Tyler, of Prescot Museum, gave a talk on herbs in British history. For centuries plants have been used in cooking, healing and hygeine. In early times, any plant used in cooking was thought of as a herb. Most diets were heavy on meat and vegetables were relatively unknown. As to healing, Rosemary pointed out that, while she could describe the "cures" detailed in old herbal books, she was not qualified to recommend them for present day use. In fact, some remedies were more deadly than the ailments they claimed to cure. Ignorance of the causes of disease led to the widespread use of fragrant herbs, such as lavender, to ward off the bad odours thought to carry the sickness from person to person. The nosegays carried by judges and other eminent figures date from this practice. Herbs had been imported to Britain from all over the world by travellers who had seen their use abroad. She showed a reproduction of an old book which illustrated a wide range of familiar and obscure plants. Rosemary had with her a large selection of herbs, many of which she grows herself, including Simon and Garfunkel's famous quartet of parsley, sage, rosemary and thyme. To start the season, Councillor Mike Doyle presented the Rose bowl trophy for Rainhill in Bloom to Mr Andy Gibson, winner in 2000 and 2002. Joint second places were taken by Mrs C Wright and Mrs M Bispham, both of whom were prizewinners last year. This is the tenth year that the trophy has been awarded. After the ceremony, Mr Milne of Banks near Southport gave a talk about thatching. 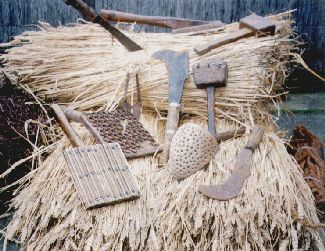 Mr Milne, who is a master thatcher, described the different materials used in various parts of the country and the specialised techniques involved in making a sound and good looking roof. He demonstrated the specialised, often home made, tools needed for the job and showed an extensive collection of slides depicting work he had done. A thatched roof was clearly an object of beauty as well as being ecologically sound, being made from renewable resources and having excellent insulating properties. An ancient material with a contemporary appeal. Tuesday 4 November. "Herbs in History", a talk by Rosemary Tyler, Curator of Prescot Museum. Rosemary will tell us about the use of herbs in cooking, medicine and around the home. Tuesday 2 December Christmas meeting. Judith Kinkaid will give an illustrated talk on pressed flowers. She also makes Christmas decorations and these will be on sale at the meeting. leisure/museum - a look around the museum with pictures of some exhibits. Wednesday 17 March. "Beekeeping". David Thornton, who is a resident of Rainhill and an experienced beekeeper, will give us an insight into this ancient craft. www.bbka.org.uk the site of the British Beekeepers Association. Wednesday 21 April. AGM followed by "The Lewis Carroll Story through the Window". Mrs Irene Rutter will give an illustrated talk describing how the author's life is depicted in the window of Daresbury church in Cheshire. www.lewiscarrollsociety.org.uk - a lot of information about the author and his works . Arthur Platt, one of the Society's Vice Presidents, has died. Arthur was one of the founding members of the Society in 1968. He was Chairman for many years. His influence helped to build up the Society to a position of importance and his work in connection with planning appeals was of permanent benefit to the area. The Annual General meeting of the Society was held on Wednesday, April 30th. A copy of the minutes can be read by clicking here. You can see the audited accounts for 2002-03 here. There must be easy ways of raising money through sponsorship, but the Rev Colin Smith was careful not to choose any of them. As he told us at the meeting on 4th March, his preferred way was to climb thousands of steps in high temperatures and humidity. He did this on the Great Wall of China and even received sponsorship for his boots. Horizontal is not a word you could associate with the wall. As well as being very rough underfoot in parts, it climbs, dives and twists through the most severe mountain country. Walking it looked hard work; building it seemed impossible. Colin clearly enjoyed himself during his five day hike and his photographs helped to share this enjoyment with an appreciative audience in the Millennium Centre. Although there is evidence that coal was extracted in the south Lancashire area in Roman times, the first recorded mine in Prescot dates from 1510. The earliest mines were simple pits sunk to reach the coal seams nearest the surface. Because of flooding the pits were abandoned at the onset of winter and new ones were dug each year. Although technology did advance somewhat over the centuries, the collieries were hugely labour intensive, and whole families of men, women and children struggled to achieve the daily "load". This was the picture of one of the area's basic industries described by Rosemary Tyler in her talk to the Society on 6 February. She went on to point out that Prescot coal powered industry in the developing port of Liverpool, to which Prescot had quick access by road. One high quality seam in particular was reserved for use in the sugar refining industry, whose part in world trade - and slavery - is so significant. Apart from the modern Cronton colliery, founded early in the twentieth century and closed in the 1980s, the mines in Prescot and Whiston remained on a small scale. Because of its position at the very south west tip of the Lancashire coalfield, the area did not develop like its neighbours St Helens and Wigan, from whom it is separated by the sandstone ridge on which Rainhill stands. Rosemary rounded off her talk with a display of mining equipment and documents which added to the picture of life in local pits. Although early, on 3 December, our Christmas meeting was a celebratory affair. A record attendance saw the launch of the book described above, which had finally seen the light of day after much work by the publications sub committee. We were very pleased to welcome Dr Betty Underwood and Mrs Ann Cole, the daughters of Florence and Robert Dickinson, as well as representatives of organisations who had contributed to the cost of the project. In the second part of the meeting Tony Sweeney took a verbal tour of St Helens as it developed from a hamlet to the present-day borough. His emphasis was on the growth of retail businesses during that time and there were references to shops long gone but well remembered by many of the audience. Wine and mince pies followed. The main part of the meeting was taken up by an illustrated talk about the Hilbre Islands by Sue Craggs, Chair of the Friends of Hilbre. She described the history of the islands, referring to their importance as a signalling station for the Dee and Mersey estuaries. She also speculated on the origins of the many ruined buildings on the islands, whose uses have ranged from ecclesiastical retreats to pig sties. She touched briefly on the importance of the three islands as nature sanctuaries, particularly for seals and migrating birds. Thursday 26 September. Presentation of awards for Rainhill in Bloom by the Chair of Rainhill Parish Council, Coun. Chris Kedge. Then a talk about the Hilbre Islands which are in the Dee Estuary , off West Kirby. Sue Craggs, who is the Chairman of The Friends of Hilbre, will describe these important nature reserves which can be reached on foot at low tide. www.wirral.gov.uk/er/hilbre.htm A local government site giving impressive details of the islands. Thursday 24 October. "Bridging the Runcorn Gap", a talk by Bob Martindale. This narrow point on the Mersey has been a major crossing for centuries. We will hear how travellers graduated from a man in a rowing boat via the famous transporter bridge, now sadly demolished, to the current bridge with its teeming traffic. Viewers of the BBC's Merseybeat police series will be familiar with the modern bridge. (That's right, the action doesn't take place in Liverpool) www.merseycrossing.co.uk/bckgrnd1.htm A site concerned with the need for yet another bridge, but giving a good historical survey of the successive crossings. "Shops and Shopping in Old St Helens". We hear from Tony Sweeney what it was like in the town before ASDA, Safeway and PC World transformed the "shopping experience". Click here for views of old St Helens. Pictures courtesy of Dave Whitmore from his site dedicated to local families. .
Tuesday 4 March. "The Great Wall of China". The Rev Colin Smith did a sponsored walk on the wall in aid of the Childrens' Society. This is his story. Wednesday 30 April. AGM followed by a talk from John Griffiths, Curator of Horology at Prescot Museum, entitled "Lancashire Watch and Clock Making". Prescot watches and clocks went round the world. Unfortunately, the small scale industry that made them couldn't survive mass production techniques. Golden Jubilee Shop Window Competition. As part of the festivities in celebration of the Queen's Golden Jubilee the Society held a shop window competition open to all businesses in Rainhill. Some years ago the Society regularly organised a similar contest at Christmas, when a prize was awarded to the best dressed window. This time the theme was, naturally, something appropriate to the royal celebrations. The winner was Occasions, the florist's shop, and Showerings the butchers came second. A plaque and champagne were presented at an informal ceremony in the St Ann's Centre. You can see more pictures by clicking here. The Society has been active in pressing for the withdrawal of proposed elctoral boundary changes which will adversely affect Rainhill. We have written to both St Helens MBC and the Local Government commission to complian at the illogical nature of the options proposed. 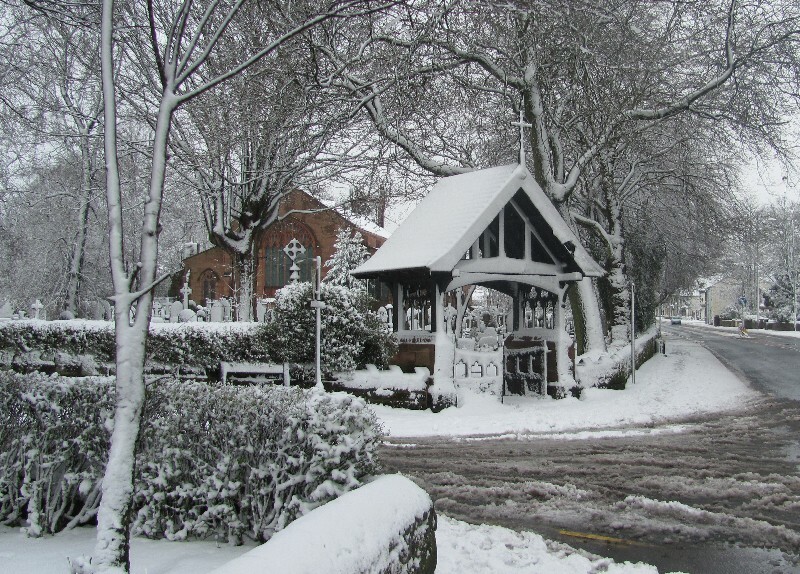 A lively discussion at the recent Parish Meeting indicated that feelings are high in Rainhill over the possibilty that some of the Township will be hived off for electoral purposes. Prescot Museum; clocks, watches - and medicines. About twenty members spent an interesting hour and a half at the Museum on March 6th. The curator, Rosemary Tyler, gave an introduction to the Museum and described not only the permanent collection of items from the history of Prescot but also the secrets of a temporary exhibition of herbal and Victorian medicine. Prescot was a world famous centre of the clock- and watch-making industry in the eigteenth and nineteenth century until its skills based on small family workshops were wiped out by foreign factory based operations. On the medical front, among other arcane facts, we learnt that onion skins were used as an early elastoplast and that the fearsome protective clothing used by those dealing with the plague had a beak full of scented herbs. We also learnt more than we needed to know about a number of unpleasant surgical instruments. Members then had an opportunity to stroll round the museum. Beechams - a dynasty built on pills. What do Rupert Murdoch, Robert Maxwell and Richard Branson have in common with an 19th century businessman, his father and his son? According to Viv Quick, who spoke to the Society on February 7th, the answer is drive and a flair for publicity. Joseph Beecham, son of the founder of the eponimous pharmaceutical firm, made Beechams a household word throughout the world by his determined publicity campaigns. No place or event or structure was immune from his urge to put the words "Beecham's Pills" before the public eye. In the 1890s as much as �95,000 a year was being spent on advertising, perhaps �50 million in today's money. Mr Quick told us that Thomas Beecham, Joseph's father, had set up a one man business selling home made pills and had eventually settled in St Helens, where he founded a factory in Westfield Street. With its prominent clock tower the building is still a feature of the town though it is now part of St Helens College. At its peak 10 million pills a day were being made to be sent all over the world. Eventually the company and the name Beecham disappeared from sight. A merger with Smith Kline led to closure of the factory in the late twentieth century and a final aggregation with Glaxo produced a multi-national company with no trace of the family name - though some of its products remain. Joseph's son eventually became Sir Thomas Beecham and made his name in an entirely different field. As a world famous conductor his trenchant views on composers and other performers became legendary. Mr Quick gave a fascinating picture of this talented family and his talk was well received by the 35 or so members and friends present, many of whom remembered from their school days Beechams' adverts and product placement, as it would now be called. The most common question put to committee members and officers of the Society is "What's happening about the shop on the corner of View Road? Something should be done about it". The shop has been empty for years and is in a state of delapidation. Its position at the centre of the conservation area makes its condition an irritant to many residents. Now, something seems to be happening. The Society has received for comment plans of a proposal to use the building, somewhat extended, for retail units and flats. The Society's planning liaison subcommittee is in the process of sending its views to St Helens MBC planning department. The long wait may soon be over. A local site for local people? Items like the one above are clearly of most interest to people in and around Rainhill. The site statistics tell us that we get hits from all over the world, especially to the page about the Locomotive Trials. But the stats can't tell us who is visiting from nearby. Do members and potential members use the site for information? We don't know. If you're local we'd be pleased to hear from you via the feedback page. Just a quick one-liner from each local visitor would give us an idea whether the site's more popular at home or abroad. Were you there in 1979 or 80? If you weren't our December meeting would have put you in the picture. Alan Jones described Rainhill 150, the celebration of the one hundred and fiftieth anniversary of the Rainhill Locomotive Trials and the opening of the Liverpool Manchester Railway. Alan's presentation took the form of an audio-visual sequence which used slides, sound recordings and commentary. All these had been skilfully combined to show what had to be done during the period leading up to the celebrations and at the carnival itself. We saw how the Rainhill community organised everything from afternoon teas to sophisticated exhibitions. On the weekend itself, bank holiday time in spring 1980, we looked at and heard the famous locomotives that took part in the great parade along the exact stretch of line where the Trials had taken place. A voice-over provided by Keith Macklin, a professional broadcaster with strong links to Rainhill, added to the high quality of the presentation. Members found themselves transported into the midst of the 100,000 visitors from all over the world who came on the celebratory weekend. Even the drizzle which marred one of the carnival days looked realistic. The meeting was held in the St Ann's Millennium Centre which, exactly a week before, had been officially opened by HRH the Princess Royal. More than 50 members and guests attended and after the presentations they heard an illustrated talk by Chris Tynan of the RSPB about garden birds. With its many mature gardens and its proximity to farmland Rainhill is well placed to receive a wide variety of birds. Less enthusiastic gardeners in the audience were heartened to hear that untidy plots are just what birds like. Although the chances of seeing a hoopoe are slim, even such rarities as the osprey might put in a fleeting appearance as birds of passage, said Chris. Thursday 27 September. Talk about garden birds by Chris Tynan of the RSPB. Presentation of awards for Rainhill in Bloom by the Chair of Rainhill Parish Council, Coun. Derek Wright. www.rspb.org.uk The official site of the RSPB. Tuesday 30 October. "The Mary Rose", a talk by Peter Bird about Henry VIII's ship raised from the sea bed. www.maryrose.org A site full of detailed information about the ship. Wednesday 5 December. "Rainhill 150". Alan Jones, a Society member, will remind us about the celebrations of 1979 and 1980. Thursday 7 February 2002. "Three Generations of the Beecham Family". Mr V Quick talks about the people who gave us the pills - and a world renowned conductor. Click here for views of Beechams and old St Helens. Pictures courtesy of Dave Whitmore from his site dedicated to local families. There are hundreds of sites which refer to Beechams and to Sir Thomas Beecham. Try a Google search. - a look around the museum with pictures of some exhibits. Wednesday 17 April. AGM followed by a talk from Paul Rooney about his visits to Romania.